The rhythmic sound of hooves clip-clopping down Savannah’s cobblestone streets signal that the Plantation Carriage Company is once again sharing the stunning, treasured history of the Hostess City with visitors from near and far. 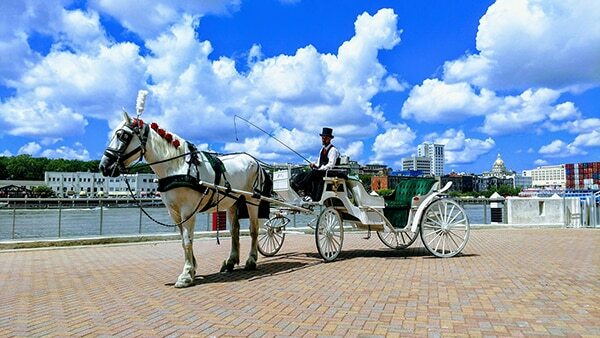 Well-versed in the language of love, Plantation Carriage Company skillfully creates the most enchanting experience with a sunset ride through the streetlamp-lit National Landmark Historic District. Romantic tours range from 30 minutes to two hours in length, giving couples plenty of time to make their own memories under the canopy of Savannah’s Spanish-moss draped trees. The daughter of a historian father and equestrian mother, Jennifer was destined to become one of Savannah’s top horse-drawn carriage tour guides. Her success, however, comes from how she views and treats her horses. Viewed as co-workers or extended family members, the horses are treated with the utmost care. 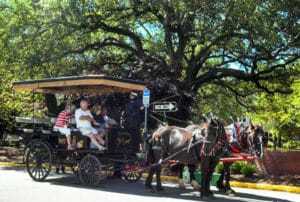 “Experience, planning, love and diligent care have allowed thousands of people to enjoy a unique experience, while protecting the horses that provide it,” Thompson explains.With a blend of knowledge, wit and history, the experienced tour guides at Plantation Carriage Company also guide visitors on an informative history tour of Savannah’s National Landmark Historic District, pointing out details about the city’s fine antebellum architecture, natural beauty and time-honored sites. This popular one-hour history tour offers visitors an opportunity to see the city from a 19th-century perspective. Horse-drawn carriages can also take visitors on specialty tours, which can be easily customized to personal interests or group preferences. For the romantically inclined, tours can be further customized to include stops for dinner and drinks. Enchanting extras like chocoate-covered strawberries, cozy blankets and red rose bouquets can also be added for wedding proposals and anniversary tours. 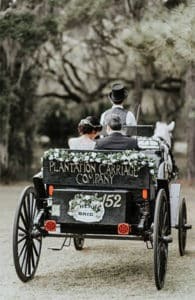 Whether you’re looking for a romantic evening or an informative, authentic overview of Georgia’s first planned city, Plantation Carriage Company has a tour that is sure to be a highlight of your trip. Plantation Carriage Company tours depart from the carriage stand on the southeast corner of Ellis Square. Historic tour tickets cost $25/person, with discounts available for children, military and seniors. Romantic tours start at $95, with additional fees for customization. To book a tour, call (912) 659-9005 or visit plantationcarriagecompany.com.